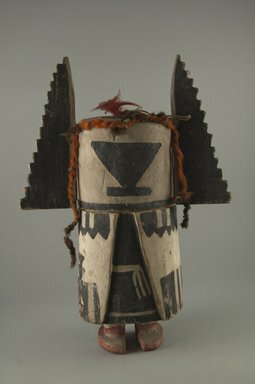 Kachina figure is probably Crow Mother-Angwusnasomtaqa and is one of the mothers of the Kachinas. She answers to the various calls of her children and certain ceremonial actions such as leading the performance and special initiation of children. As such she knows all the etiquette, moral ethics and virtues thus appears always to be very stately. Wing like forms on each side of head and the dark triangular shape with bar at base symbolize facial features are characteristic. Figure is painted blue, black, and white; feet are painted red. Feather headdress missing, surface wear.